Utagawa Kunsada II (1823 - 1880) Eight Dog Heroes: Iwai Kumesaburo III as Hikiroku’s Daughter Hamaji, 1852. Oban. Kunisada II’s Stories of Satomi Hakkenden, also known as the Eight Dog Heroes is one of the really great woodblock print series of mid-nineteenth century Japan. The artist is partly (and unfairly) obscured behind the towering shadow of his illustrious teacher and father in law, Kunisada I (Toyokuni III). 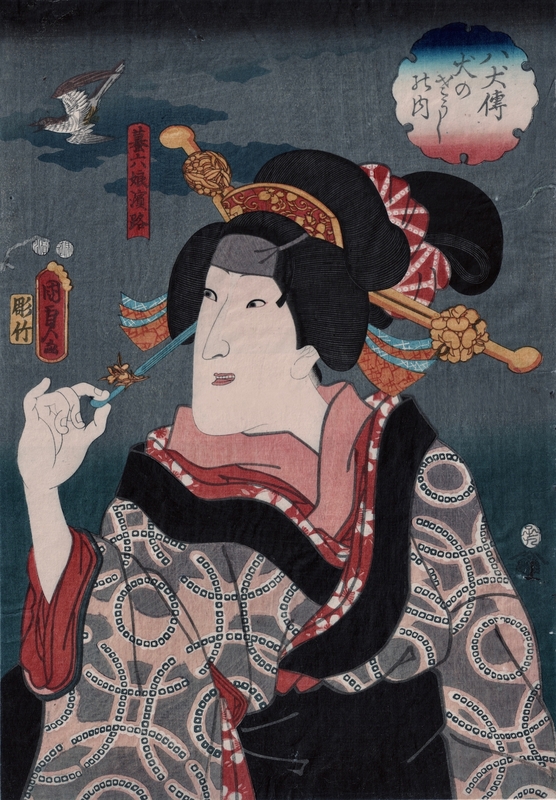 Kunisada II worked in the style of his master, but never achieved the same level of success. His prints include over 40 series, mostly of actors, and this extensive series is by far his greatest achievement. The prints in this series were all produced to the best ‘deluxe’ standard with brilliant, expensive pigment, careful bokashi shading and extensive mica, lacquer and embossing. The story was originally a novel which took nearly thirty years to complete, between 1814 and 1842 and appeared at regular intervals in 106 volumes… for Edoists it would have been similar to a long running Netflix season such as Game of Thrones. It was quickly turned into a popular kabuki play. The complex plot features eight offspring of a supernatural marriage between a princess and her father’s dog. Shamed at the birth of her children, she kills herself and the eight beads of her rosary, each representing a Buddhist virtue, become crystal orbs and disperse; the children being reborn to normal mothers sixteen years later. Each of the offspring carries the Japanese word for dog in his name. The plot is too complex to summarise, but there are numerous websites devoted to the story both as a novel, a kabuki drama and latterly as a video game and manga cartoon. Hamaji is needless to say tragic. She loves a young handsome man but is driven towards an older man that she hates. Her end is one of the great dramas of kabuki. The print is stunningly good. The mitate, if there is one, is to disguise the actor, Iwai Kumesaburo III, as an illustration to a novel. The tragedy of Hamaji is foretold in the dramatically descending cuckoo, associated with the longing of the spirits of the dead to return to their loved ones, visible in the upper left. The print is a superb, an early impression, very crisp and with outstandingly good colour. There are a few worm tracks now covered by old repairs neatly done, on the reverse.